TOKYO — Japan's public broadcaster NHK sent out a false alarm about a North Korean missile launch Tuesday — days after a similar mistake caused widespread panic in Hawaii. The error was corrected within minutes. An NHK alert reading, “It appears that North Korea has launched a missile,” was sent to app users just before 7 p.m. Tuesday (5 a.m. ET). A banner with similar wording appeared at the top of its website. The information was not released on the broadcasters TV channel, according to local reports. Within five minutes, NHK deleted the push alert and stories related to the warning, and issued an apology on its website. Seemingly due to the quick response from the broadcaster, there was limited social media commentary regarding the incident in Japan. It was not immediately clear what triggered the mistake. 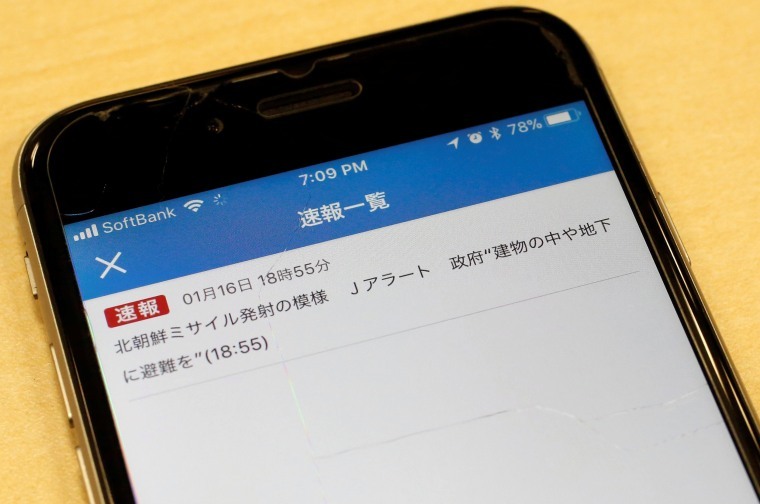 NHK's error came just days after thousands of tourists and residents in Hawaii received mobile alerts on their phones warning of an imminent ballistic missile strike. Tensions are running high over North Korea's missile program and after President Donald Trump recently warned North Korea's leader, Kim Jong Un, that he has the bigger "nuclear button." It was a different reaction to that seen on Saturday, when Hawaii's Emergency Management Agency didn’t correct the faulty message for 38 minutes. There was no indication that North Korea reacted after the Hawaii error, Defense Secretary Jim Mattis said Monday. Regional tension soared after North Korea in September conducted its largest nuclear test and in November said it had successfully tested a new type of intercontinental ballistic missile that could reach all of the U.S. mainland. It regularly threatens to destroy Japan and the United States. Arata Yamamoto reported from Tokyo. Nick Bailey reported from London.